During the Fall 2015 semester, I helped Dr. Lindsay DiCuirci teach a graduate seminar entitled “Women and American Periodicals” at UMBC. The course highlighted some of the United States’ most influential women writers who first published their work in American newspapers and magazines, specifically examining how these periodical writers harnessed this print medium’s distinctive potential to challenge conceptions of womanhood and develop a variety of literary forms and voices. A large part of the course was dedicated archival research of periodicals spanning the nineteenth century, and nearly half of the seminars were held at the university library’s Special Collections Department. Student work at the archives is partially documented on the class blog “Scribbling Women”. Through a collaboration with/sponsorship by the American Antiquarian Society, this work resulted in a digital exhibition (using Omeka): Mill Girls in Nineteenth-Century Print. The exhibition focuses specifically on printed materials, largely pulled from periodicals. Primary sources, all pulled from the AAS collections, include The Lowell Offering, The New World, The New England Offering, The New York Times, The Voice of Industry, Southern Rose, and others. 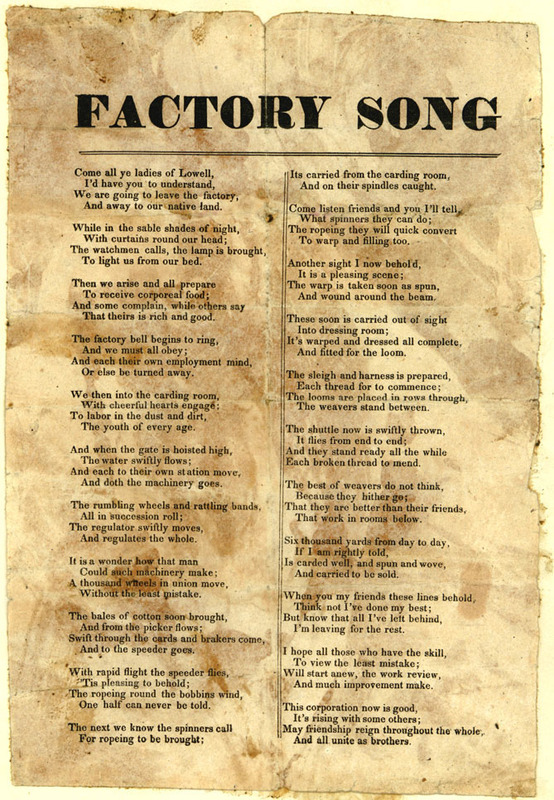 These include news articles, songs, poems, labor constitutions, petitions, and various engravings and artwork. The students working on the project structured the topic around three major categories: mill girl culture, working conditions, and activism and reform. One of the features I’m especially happy about is the use of a flip book that allows readers to read a few selections from the site. 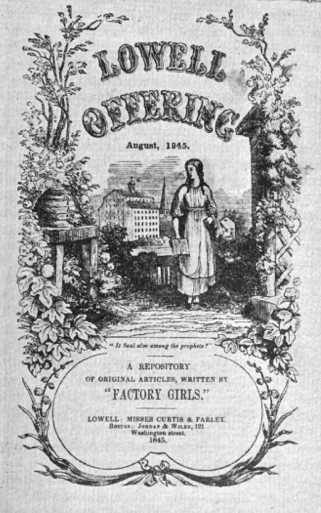 One such example “Leisure Hours of Mill Girls” (from the second issue of The Lowell Offering) is available here. Since the exhibition focuses on nineteenth-century print, one of the limitations the class faced was the desire to include some of those iconic photographs taken at the turn of the century (and the subsequent decades). I thought it might be nice to include some of them here. Girls at Weaving Machines, Evansville, IN, 1908. A young girl works as a looper at the Crescent Hosiery Mill in Scotland Neck, NC. Some of the spinners in Pell City Cotton Mills. A little spinner in the Mollahan Mills, Newberry, SC. Photo by Lewis Hine. A young spinner at Whitnel Cotton Mill, NC. Iconic photo by Lewis Hine. Young girls work in the spinning area of a textile mill. Many of these are from the work of sociologist and photographer, Lewis Hine (1874-1940). Art, investigative journalism/exposé, documentary, social reform. Hine’s photography for the National Child Labor Committee (NCLC) encompass all of these categories. an emaciated little elf 50 inches high and weighing perhaps 48 pounds who works from 6 at night till 6 in the morning and who is so tiny that she had to climb up on the spinning frame to reach the top row of spindles. Many of Hines observations of work accidents (including loss of limb or even death) were never formally reported by overseers. In exposing these stories of child labor, Hines was frequently threatened by factory police and foremen. Today they are history, iconic art, and a chilling reminder of some of the existing horrors in industrial work. Please check out the AAS exhibition: Mill Girls in Nineteenth-Century Print. 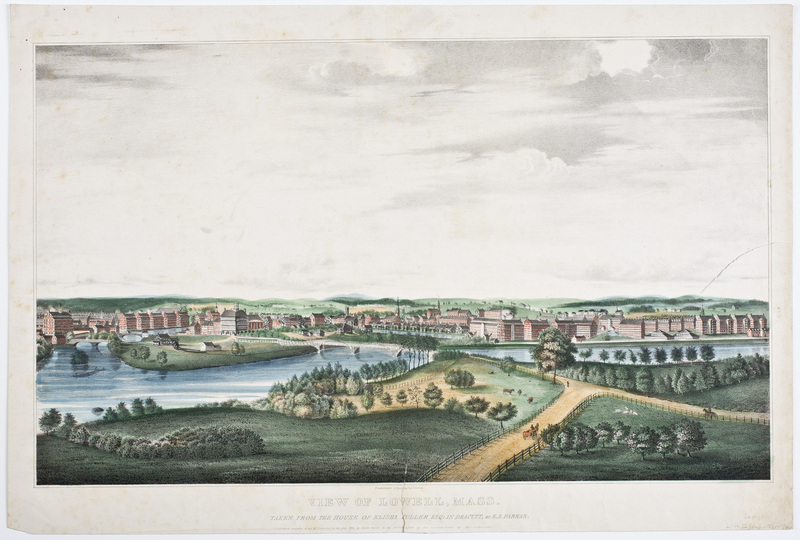 This entry was posted on February 9, 2016 by k.a.wisniewski in Digital Exhibition, Literature, pedagogy, Periodicals, U. S. History, UMBC News, Work Report / Progress and tagged Digital Humanities, exhibition, herstory, History, labor history, Literature, mill girls, pedagogy, Periodicals, print culture, public humanities, Publishing, women's history.